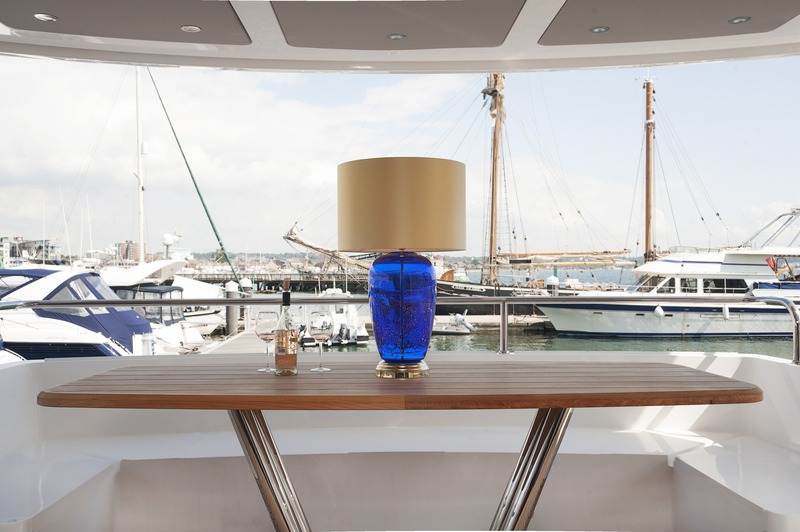 Alexander Joseph’s first ever one-off creation named Blaze, has been sold for £20,000 to a private Bahraini client and will take centre stage in the main salon of a super yacht. Made as a demonstration of master craftmanship to launch the business itself, the luxury cordless lamp took centre stage in the initial marketing campaign. Beth Nash, marketing manager, said; “Blaze is a truly magnificent lamp, completely handmade by our team of craftsmen, every detail lovingly completed to perfection. The base and all fittings are painstaking finished in 24ct gold, including the lampshade ring, despite the fact it is unlikely to be seen. The body is handblown from high grade glass in Cobalt Blue, infused with 24ct Gold. The 18” lampshade is handmade and finished in Gold satin silk. All the technology is discreetly hidden in the base. Alexander Joseph are now working on their next one-off piece which is to be unveiled towards the end of November. The company have also agreed to make a commission piece for a charitable auction with all proceeds remaining with the charity.